Space Invaders is an arcade game, which was first released in 1978. It is a 2D horizontal shooter where the player controls a cannon by moving it across the bottom of the screen and firing at a swarm of aliens. Points are earned for every alien it shoots down. A UFO will occasionally move across the top of the screen and award bonus points if destroyed. As more aliens are defeated, the game speeds up. The aliens also fire shots randomly as they approach the bottom of the screen, and If the shots hit the player, he loses a life. The cannon is partially protected by several bunkers that are gradually destroyed by numerous blasts from the aliens or player. Defeating all the aliens brings another wave and repairs all bunkers. The game ends if all bunkers get destroyed or the aliens reach the bottom, or if the player loses all lives. It is important to set out goals before you start a new project. My plan is not to faithfully reconstruct the original space invaders game, but to create space-invaders-like game with only the core elements. It is also very common in game development to first create a rough prototype using the core mechanics you would like to test out, and later add "polish". So the plan is to create a space invaders prototype. In this prototype, I'd like to have the canon controlled by the player, the alien waves that gradually travel towards the canon, and most importantly, the ability to shoot for both aliens and the canon. I will thus ignore the UFO, and the bunkers, but these can easily be implemented. Note that all games can be decomposed into very basic elements (I highly recommend this great talk by Raph Koster). In space invaders, two basic elements can be recognized -- shooting, which can also be seen as a form of collision detection, and movement. Most AAA games involve some kind of shooting or collision detection, and movement. The complexity of these games arises from the number elements that are mixed together, the number of dimensions, the complexity of the movement, and the various game rules. So, developing even a simple clone of space invaders can teach us a lot about games and game development. So, having set our goals, let's start programming! There are various ways to create a window. You can either use the native API, e.g. Cocoa, X, or WinAPI, or you can use a cross-platform library such as Qt or GLFW. If you want complete control over your code, you could choose the native API approach, but to avoid headaches and to easily make this small project cross-platform, I decided to go with GLFW. GLFW is lightweight, and has a simple C API. where in the first argument it receives the error code, and in the second argument it receives the error description as a UTF-8 encoded string. We create a simple error callback that prints the error description to stderr. Unfortunately, I don't have Windows installed, but perhaps this article can help you setup a GLFW project in Visual Studio. That should do it! 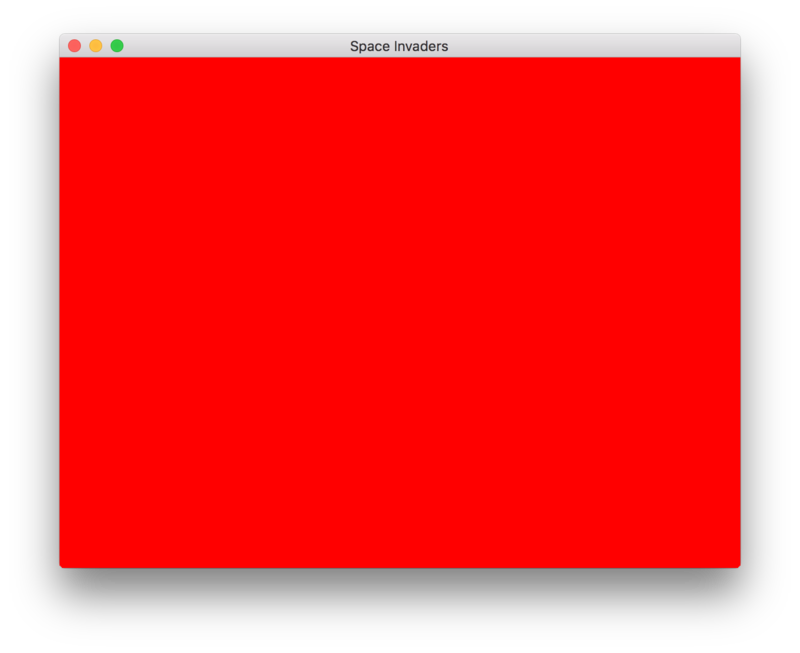 If you successfully compiled the program, you should see a red window titled "Space Invaders", like the one above. As you might have realized from this post, creating a simple window with an OpenGL context in C++, is no simple task, even using a library like GLFW. Note that we are still not drawing anything. Setting up some simple drawing routines also takes quite some setting up in modern OpenGL. Fortunately, we only have to do all this once, the next game will reuse a lot of the code I'm going to present in this blog series.